It’s important for property managers to ensure tenants show proof they have the required insurance outlined in the lease. 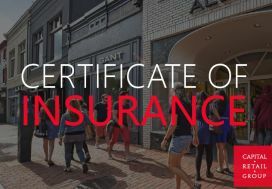 A Certificate of insurance(COI) is the most common form of proof and is most often required pursuant to the lease and must be received by the Landlord or designated property manager(Capital Retail Group) on or before the Lease Commencement Date. If the COI is not received the Tenant shall not be permitted to perform any work on the Premises or otherwise use or occupy the Premises until such certificates are received by Capital Retail Group. Commercial general liability insurance with a combined single limit for bodily injury, including death, to any person or persons, and for property damages, of not less than $500,000.00 per occurrence, $1,000,000.00 aggregate, plus excess/umbrella liability insurance containing a per occurrence combined single limit of $1,000,000.00 aggregate. 1) Workers Compensation: Must meet the requirements of the state worker’s compensation laws and employer liability insurance in an amount not less than Five Hundred Thousand Dollars ($500,000.00). Endorsement is required naming all additional insureds.